Splitter Orchester consists of a variety of autonomous and ultra-specialised composer-performers who choose not to work in an institutionalised framework and who question existing hierarchies in the music establishment. The ensemble tends to use sound as the medium with which to explore artistic ideas, as opposed to actively seeking to continue a specific historical dialogue within the tradition of music. The whole group relies on each member equally and deliberately denies established leadership roles to create an experimental production field, which is process-oriented and, therefore, socially relevant in a broader sense. Despite vigorously honouring diversity of individual artistic approach, as well as a continual resistance towards repeating patterns both in our aesthetic and our process, the ensemble has developed, over the six years since its inception, a distinctive group sound and certain tendencies have taken hold in our continued collaborative exploration. The recognition that certain blind spots may have developed in our collective awareness led to the idea of inviting a guest collaborator as a means of gaining an additional, more removed perspective, as well as an active creative influence. 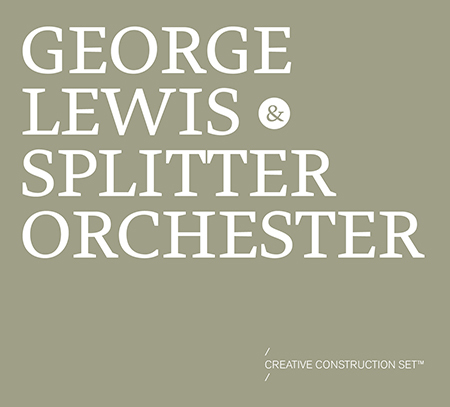 George Lewis was invited as our collaborator and Creative Construction Set™ (CCS™), premiered in November 2015, was the major part of his contribution; he also performed the work with Splitter. The unique nature of the Splitter Orchester requires that an outside contribution provides the necessary sensitivity and clarity to urge the ensemble towards new processes whilst retaining freedom and creative authority for each member. CCS™ extended our communicative tools and capacity within the ensemble. Each member was able to provide clear aesthetic suggestions to their fellows (via prompts written on cards), although the responsibility for final action remained with the individual musician. This facilitated both a new level of mutual feedback and influence that resulted in an expanded dialogic awareness within the ensemble – both of our shared and individual aesthetic and process. One major aspect of this particular working period, which unfortunately cannot be conveyed through these recordings, was the social and collaborative dynamic that emerged. Somehow, perhaps through a sensitive mutual respect or trust, a keen awareness and curiosity developed which led to a generous willingness and excitement to create. To me it seemed a unique exchange where all parties truly benefitted on both an artistic and social level. The recordings compiled here are partial documents of this mutual exploration.